If you have visited my blog before, you may have seen my review on the MAC Shaping Powders from a couple of weeks ago. If you read that post, you will have seen that I created my own MAC palette for highlighting and contouring. I bought three of the Shaping Powders which are lighter highlighting shades and three of the Sculpting Powders which are bronzing and contouring shades. So, for today’s blog post, I am going to share with you guys what I thought about the MAC Sculpting Powders and if I am going to continue using them as part of my highlighting and contouring routine. Sculpt is the lightest shade out of all of the MAC Sculpting Powders that I have bought. This powder is perfect for an everyday basis if you want to get a very light and natural contour. This is just a couple shades deeper than my actual skin tone, so it is good for contouring with, without it being too much over the top. I have even used this Sculpt Shaping Powder on my sister who has a very fair complexion and it still looks perfect and natural on her skin, so it is a very diverse shade. The middle tone in my palette is the shade Shadester. The shade is slightly more of a warm tone contouring powder which makes it perfect for bronzing with as well as contouring. What I like to do with this bronzer is take this on my large Real Techniques Blush Brush and give it a light brush around the outer parameter of my face to warm up my complexion. 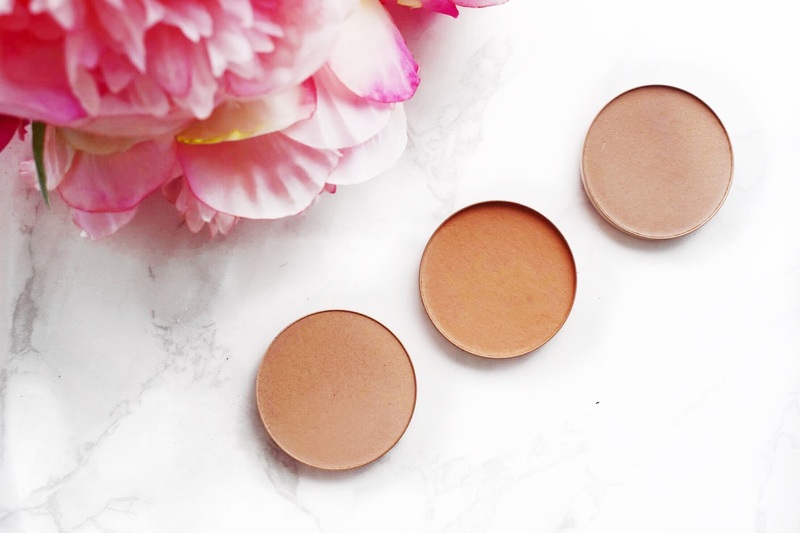 I think on a deeper skin tone this would make a lovely contouring shade, but for me it is definitely more of a bronzer that I like to use on a daily basis to bring life back into my face after using a lot of full coverage products. Lastly, the final and deepest shade in my palette is Shadowy. This is a deep contouring shade that is ideal for my skin tone. To look at from face value it is a deep brown shade, but when you swatch this on the back of your hand, it is easy to see the grey undertones running through it, which makes it perfect for contouring with if you have a medium/tanned skin tone like I have. At first, I was a little nervous to dive into this shade because of how deep it is, but the key is just to go in with a light hand and make sure that it is well blended. As I apply these Sculpting Powders, it is easy to see that the formula is very similar to the Shaping Powders, which have become one of my everyday makeup products. They are creamy and buttery, which allows them to blend into the skin and other products that you would have on your skin just beautifully. The more I use these, the more I fall in love with them and cannot stop using them. I have even been using a mix of the shades as an eyeshadow transition shades and it looks so beautiful. I don’t feel like I have to make this post any longer, because I have said everything that I want to say about them. The selection of shades available is beautiful, they blend in like a dream and they add depth which is just perfection. I will leave a link to these down below in case you want to check them out for yourself. Make sure to leave me a comment and let me know if you have tried these out and what some of your favourite powder contouring products are!